You are here: Home / Blog / ‘Tis Christmas Time! Now that Thanksgiving has come and gone, it’s time to decorate “the halls” and work on Christmas gifts. I am finding there are not enough hours in the day and I am sure some of you feel the same. I just finished a couple of gifts for the grandkids and thought I would share some photos with you. 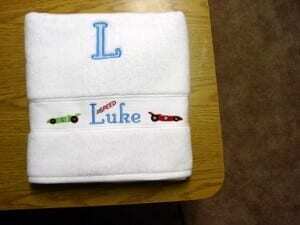 I used my new Boy Add On Sets as well as the applique Font and I think they turned out well. You can look for a satin alphabet (1 3/4″ ) to match the applique alpha soon. Also am working on a 3/4″ satin alphabet as well. 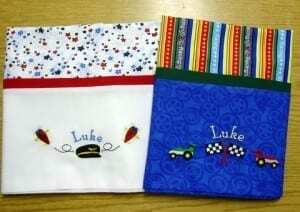 I love doing those pillow cases. Quite addictive may I add. They come together so quickly. I used the Sausage Pillow method that I had heard about on AllBrands’ SewForum. There is a video on YouTube demonstrating how to do it – it’s great and fast. You might want to check it out if you are not familiar with it. And my boy add on designs work well for them, as you can see. Are you pleased with the way your gifts are turning out? Why not come and join our yahoo group and let us see your projects. It’s so fun to see what others are doing and such an inspiration. By the way, Yahoo group members get special little gifts (see one below). And while we are busily running around buying and making gifts, getting ready for Christmas, let’s not forget why we celebrate this Season. Take some time to reflect on His birth and the great gift of salvation. 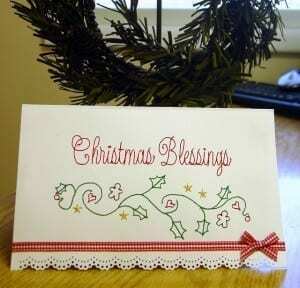 Wishing you deep joy and contentment this time and always. Wow! These projects are great!